After what felt like the longest winter, spring has been fairly nice to us. We’ve had some beautiful sunny days and the snow seems to have mostly disappeared. For anyone who loves to be out in their gardens surrounded by beautiful plants or perhaps you like to grow your own vegetables, now is the time of year to get planning what your growing season will look like. I had the pleasure of visiting with Leslie out at Cornell Design and Landscaping and once again, I was surprised by how much this local business has to offer. Cornell Design and Landscaping is into their 11th year as a family run business in Moose Jaw, which I think is a huge accomplishment. Adding to this they like to support local businesses and people whenever possible which is always a wonderful thing to see. Local products you can expect to find will be Gravelboug Mustard, pottery, Zak’s Peas, and Prairie Popcorn. If you take the quick drive south of Moose Jaw to see Leslie you will find anything and everything you will ever need to make your backyard an oasis. They have a greenhouse where they personally grow annuals, perennials and have the largest selection of succulents in Moose Jaw. They sell a drought resistant sod that needs 50% less water than your average grass. You will also find ornaments, solar lights, brick products, seeds, pots, fountains, fertilizer….and I could go on, but I encourage you to check it out for yourself! If you don’t have a green thumb or maybe you just want to hone in those skills, Leslie also offers a class every Saturday. The topics will vary week to week, with the first class being April 13th and focusing on succulents and fairy gardens. You will also find a cute little Bistro nestled in the garden centre. Here you can enjoy snacks, sandwiches and a good cup of coffee. Cornell Design and Landscaping is open from 9-5 pm Monday to Saturday for April and look for the hours to lengthen towards May. You can follow them on Facebook and Instagram to keep up to speed. I have saved the best for last and I am so excited to share that we have partnered with Leslie and her team. In the coming months you will see a beautiful new flower bed welcoming you to Tourism Moose Jaw. We will post pictures of the process and updates on how we keep everything healthy and happy! Along with this, look for weekly gardening tips and tricks from Leslie as well as features on some of the products they offer at Cornell. If you are out and about enjoying this sunshine, stop in for a visit at Cornell Design and Landscaping and see for yourself all they have to offer! In case you haven’t heard, Moose Jaw will be host to the first Saskatchewan Airshow in more than a decade. It’s set to be a huge event with a projection of 40,000 people visiting to take it in. Running alongside it is the Annual Moose Jaw Sidewalk Days Festival, a huge draw to locals and tourists alike. In case that wasn’t enough it all kicks off with Canada Day Celebrations at the beginning of the week. If you are looking to make the trip to Moose Jaw, this just might be your week to do it! This will be my second year co-chairing the Canada Day Committee. I get to work with some of the most talented and community minded people. They all bring their own set of skills and make putting this event together not only fun but very productive! We have something new planned for this year, the “Notoriously Canadian CabarEH”. This will be the night before Canada Day and something for the adults. We are encouraging everyone to come out in their over the top Canadian clothes, like the ever popular denim tuxedo and everyone’s favourite, flannel. We will have a 50/50 draw, prizes for best costumes, local bands and some great specials. All of this goes down at The Crushed Can so be ready to party, eh! For the Canada Day events happening this year in Crescent Park, we are bringing back the Living Library. This is a chance for kids to get out and try some new sports and community programs. Two big favourites returning this year are Dance Fitness with Kyra and JJ Soccer. Along with this we will have entertainment on the stage, food trucks and the Farmers Market. There is something for everyone! Next up is Sidewalk Days, the annual street festival stretching 3 days at the beginning of July every year. With over 200 vendors, food trucks and a children’s village, this is a fantastic free family event. You will also find 2 stages loaded with entertainment as well as the Déjà Vu Café Songwriters Showcase. Sidewalk Days starts on Thursday July 4th and runs until Saturday July 6th. If you are coming in for these events I highly recommend booking your hotels and campgrounds ASAP so you don’t miss out as they will fill up fast. 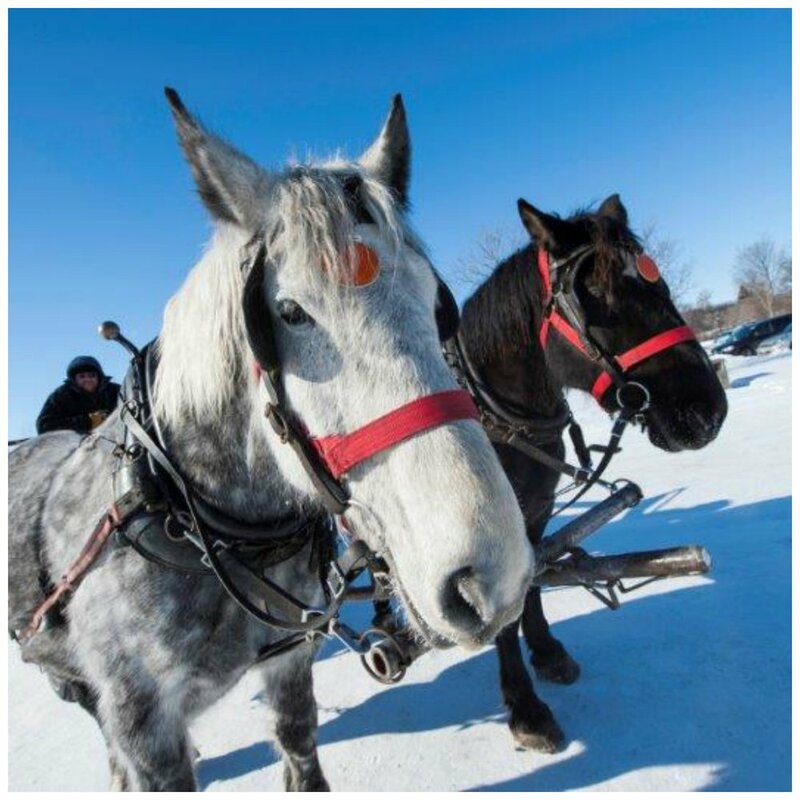 For a list of accommodations please visit, www.tourismmoosejaw.com/sleep. This is sure to be a great summer here in Moose Jaw, which event are you most looking forward to? There are two experiences you can have at downtown businesses in Moose Jaw that I highly recommend. If you haven’t been, put them on a to-do list because I guarantee you will thoroughly enjoy both! The first is the Oliv Tasting Room. To start, it’s located in the historic and utterly beautiful Grant Hall Hotel. They specialize in olive oils and balsamic vinegars. Oliv carries so many flavours your taste buds will get a work out! Here you will find some of the best customer service around. The staff knows the product they are selling inside and out and can guide you through a tasting experience to help you find exactly what you are looking for. It should also be mentioned that this Oliv location is the flag ship store for the international franchise! If you are planning an event, hosting a bridal party or have family visiting, I suggest you make this a stop. If you call ahead and let Charmaine and the staff know they will prepare a wonderful tasting experience. They will walk you through the different varieties of olive oils, moving onto the flavoured versions and mixing in the balsamic vinegars. They will show you how to elevate the simplest of pleasures like your movie night popcorn! The second business I would like to talk about is Prairie Bee Meadery. Located in a quaint shop on the first block of Main St. this locally owned and operated store will impress from the start. Just like Oliv, Prairie Bee Meadery will walk you through their products and let you taste test the different varieties of wine mead they carry. So if you’re like me and picking between two things can be a tough task at times, they will help make the process much easier for you! You can start with their original honey and work your way towards their chocolate strawberry port wine. Each different flavour is unique on its own, with some of the fruit coming straight off their own farm. This hyper-local product is sure to impress and makes an excellent gift. If wine isn’t your thing, try the honey. Made from their very own bees this product is so special in its own right. Their bees were even featured on The Amazing Race Canada. Along with the honey you will find other products from local breweries and interesting items like flavoured salts. If this cold weather is making you stir crazy like everyone in my house, get out and experience these two fantastic stores and everything they have to offer! In case you haven’t seen it in the news lately, Mac the Moose has become a celebrity over night. He has made it onto Canada’s own This Hour Has 22 Minutes, The Late Show with Stephen Colbert and numerous other news programs and papers. Long before all this craziness started swirling around, I had already fallen in love with the cement giant outside my office window. Mac is the most googled roadside attraction in all of Canada. It is estimated that he has anywhere between 125,000 to 150,000 visitors a year. If you stop to think about it, how many homes all over the world have a family picture hanging lovingly on the wall with Mac in the background. Or how many postcards with his picture on it have been sent to friends and family near and far, even the memories that have been shared around the kitchen table about long ago trips that included a stop at the giant moose. Sure Mac isn’t as beautiful as the Silver Moose in Norway, but Mac is ours. He has sat watch over our city for 35 years. Just about every kid that grew up in Moose Jaw in the 90’s remembers, to put it gently, sharing their artistic abilities with him. So many memories include a little piece of Mac. Mac was originally built in 1984. His sole purpose was to get travelers from Highway 1 to stop and check Moose Jaw out, with the hopes that they would spend some time in our city. To this day, he still does just that, but what I have witnessed over the last few weeks of Mac’s stardom has reinforced what I love about Moose Jaw. A 10 tone cement Moose has brought a community together. We have had offers from so many of our local businesses and residents willing to lend a hand and help put him back on top. It has been heartwarming to say the least. To me, Mac is a beacon that sits on our cities edge, welcoming visitors from near and far. It puts a smile on my face seeing all the happy people taking photos with him and to see the sheer joy on the faces of little ones as they glare up at our giant. I have met countless people over the last 2 years that have left an impression on me and made my job that much better…all because of Mac! All I can really say for sure is that this last 3 weeks have been a wild ride with Mac leading the charge. The community support has blown all of us away and we can’t wait to get working on the old guy to put him back on top! We are truly lucky to have the beautiful Moose Jaw Cultural Centre, Home of the Mae Wilson Theatre. This week alone they have 3 very different events. Last night I had the opportunity to take in Sarah MacDougall on her “All the Hours I Have Left to Tell You Anything, West Coast Tour”. Coming up Friday is a screening of the movie Supergrid by the Director and Producer of the popular Wolf Cop. Finishing the week out is Brenda Lee Cottrell and The Legends playing memorable music of the ladies of the 60’s, with favourites like Patsy Cline and Etta James. If you keep an eye on the Cultural Centre’s website, www.moosejawculture.ca, you will find all sorts of great shows happening. In the coming months they have the Snowed In Comedy Tour, PIGS: Canada’s Pink Floyd, The Stampeders and the iconic Sharon and Bram with their Farewell Tour. The setting is gorgeous and intimate and has come a long ways since my childhood days of the Capital Theatre! I still remember waiting in line for popcorn and tickets. One thing that has remained from the original theatre to now is the beautiful plaster works that stretch the walls. These were still visible when it was a movie theatre. Having been renovated in 2004, it has been transformed into a space we might have walked into in 1912 when it was originally built and named the Allen Theatre. You can also enjoy your favourite licensed beverage now! The Moose Jaw Cultural Centre is home to more than the Mae Wilson Theatre. You will find the Mosaic Gallery at the Conexus Visual Arts Centre and the Saskatchewan Festival of Words office as well. It truly embodies art and culture. The Moose Jaw Cultural Centre is located in the heart of downtown Moose Jaw at 217 Main St. North. To make an easy date night or a fun night out with friends, grab some tickets to a show and enjoy some of the local restaurants within walking distance of the theatre like Nit’s Cafe, Veroba’s Family Restaurant or Chrysalis Coffee Roasters. The past 3 months of writing this blog has been so much fun. I’ve had some great food, been to shops around town I may have missed out on and more recently, took in a show at the Mae Wilson that I might not have attended otherwise. With that being said, I will be checking more events out at the Moose Jaw Cultural Centre. I invite you all to do the same, even if you don’t know the performer, take a chance and just enjoy the surroundings of the Cultural Centre. A huge thank you to Derik Cronan, GM of the Moose Jaw Cultural Centre for the tickets to Sarah MacDougall. It was a wonderful evening and the perfect date night mid-week! No More Moosing Around, Time to Get Serious. I am humbled by the incredible outpouring of support over the last week and a half. I’m flattered - I haven’t had this much attention since mating season. It shows that when you mess with a Moose Jaw moose - our herd WILL BE heard loud and clear across the province, the country and around the world. - Should we take measures to make me taller and reclaim my former status as “World’s Tallest Moose”? - And, If so, how should it be done? - Anyone who liked, shared, tweeted and retweeted this story. for the continued care and moose maintenance over the last 15 years. Whatever happens, they will be the ones guiding this process. The world needs to know – I am not ashamed of my size, nor should anyone else be. But this is not a size issue – it’s a pride issue. I bear no grudge against my shiny, Clovenhoof counterpart Storelglen. But much like my natural enemy the bear, his Norwegian creators stalked me with predatory purpose, horning in on my territory. To borrow a term from one of my animal friends: when you mess with the moose, you get the antlers! So I, Mac The Moose, hereby give permission for my Tourism Moose Jaw caretakers to take me to new, record-breaking heights! How this happens will be their decision – it could be any of thousands of suggestions that have come forward. I love to skate, I’d be proud to wear a Mountie stetson, and I wouldn’t even mind being fitted for stilettos – though with our winters that may not be the most sensible option. If you haven’t been to Mitsu Sweet Café, you need to! I had one of the best lunches there and I would like to share my experience with you. Walking into Mitsu you know you are in for something special. The décor sets a comfortable and relaxing tone but it’s the little design touches that really stick out. From the 3 chandeliers that hang around the front of the restaurant to the large cherry blossom covered ceiling, it’s easy to see a lot of care and attention went in to arranging this space. What originally started as a Japanese dessert café has now grown into a full service sushi restaurant. They have everything from Nigiri to Sashimi and any kind of roll you could possibly want. Mitsu also has a full service coffee bar and I strongly recommend the London Fog. If you are heading here for a night out they are also licensed and have a large assortment of Sake and other Japanese specialty drinks. I ordered the Pumpkin Coconut Soup and Tempura Vegetables and Jacki got herself the Shrimp Bento Box. I would go as far as saying that you must try the sweet potato tempura if you are ever at Mitsu. It was perfectly crunchy and when dipped in soya sauce, the mixture of sweet and salty was beyond delicious. No good meal is complete without dessert, we asked our server what their specialty is and she suggested we try one of the crepes. She brought us this perfect cone shaped crepe stuffed with chocolate, ice cream and fresh raspberries; it was truly heaven on a plate! I can say without a doubt that the lovely young woman that served us made our experience even better. She was friendly and attentive and took excellent care of us. The service, décor and overall cleanliness of this restaurant are top notch. I would also like to mention that the Saskatchewan Festival of Words hold their Performers Café here. It is an excellent place to get your favourite beverage and enjoy some live music. Look for Annie MacLeod on January 31st and Shayna Stock on February 28th. If you are looking for something fun and unique to try, visit Mitsu Sweet Café! The little design touches make Mitsu Sweet Cafe truly special. The cherry blossom light fixture covering the ceiling. If you have ever been to the Sahara Spa, you know exactly what I mean when I say “Transported Away”. It is one of those places that you walk into, and immediately feel like you’ve been whisked away to some fancy resort. If you haven’t been to Sahara Spa, I am going to tell you why I think it is a must, whether you are from Moose Jaw or planning a trip here. The spa is located in the old CN Rail Station. Originally built in 1919 from Claybank bricks and Tyndall stone, this once bustling train station has been completely remodeled inside. However, the outside still has the charm of the rail station, with its large middle section flanked by symmetrical wings on each side. You will also see that the doors and windows are perfectly spaced apart as per the original architectural design. It was designated as a historical train station in 1992 and a municipal heritage site in 2002. Sahara Spa has been operating from this building since January 2004. The inside of Sahara Spa is stunning and every little detail has been looked after down to the specific lighting to each area. There is soft and relaxing music playing and each and every person is greeted by their front desk staff with the offer of a cool glass of water or hot tea. From the minute you enter, you are treated with the utmost care and attention. The staff at Sahara Spa are truly amazing, and just one of the many reasons I love visiting this business. They are qualified, educated and all participate in ongoing training. They are a Quality Assurance Approved Spa which means they have the highest standards related to health, safety, hygiene and customer service. They share this with only 21 other spas across Canada. Their treatments are focused on services you would find all around the world. Their 8 chair pedicure suite is perfect for bridal parties, birthdays or just relaxing with your best friend for an hour. Spa Manager Kim recommends their Sahara Signature Canadian Rosehip Stone Massage for a one of a kind experience. There are some new services available at the spa. They now offer sunless spray tanning, acupuncture and dermaplaning. Follow Sahara Spa on Facebook to keep updated on specials. I would like to thank Kim for taking time out of her day to chat with me and show me around the spa. Sahara Spa also supplies one treatment to each of our summer students so they can experience the spa for themselves and we greatly appreciate that! Miss. Simba has been our office cat for just over a year now. She is sassy, rough around the edges and demanding when it comes to meal time. Holding a meeting with her in the room always seems like a good idea, until you’re the one taking the minutes and she chooses your work book to curl up on. She didn’t always have the easiest life, but it is easy to see now that she rules the roost here and is loved by us all so much. When Simba was picked up by SCRAPS she was in pretty rough shape. It was clear she had recently had a litter of kittens (unfortunately they were never found) and was in need of some help. They scooped her up, treated her infection and placed her in a loving foster home where, for probably the first time in her life, she didn’t have to fight and work every day for survival. Being on the edge of town with the wide open prairie literally steps away comes with its small issues. Wind gusts that cut through you in the middle of winter and take your breath away, lots of floating garbage that rolls into the lot and probably our least favourite thing, mice. They can be hard little pests to keep away, especially when fall rolls around with cooler temperatures. We came up with a plan to combat them. Keeping community in mind, we contacted SCRAPS for their help. At first we had looked at the option of a small orange kitten. Probably one of the cutest little creatures I have ever seen. However, after some deliberation the decision was made to give a cat, like Simba, who might not be the easiest to adopt out, a home of their own. SCRAPS brought Simba in for a trial and I am confident in saying within the first 5 minutes, we knew she was the right cat for the job! We can’t thank SCRAPS enough for all the hard work they do. They are non-profit and volunteer run which has its own uphill battles at times, but they make it work. When looking for a new feline friend to add to your home, please consider adoption. Fostering these cats is also an excellent way to help. Tourism Moose Jaw would also like to thank Paws N’ Play Grooming and Boutique. While we closed for the Holidays they housed our little office cat and returned her freshly bathed and nails trimmed! They offer a lot of services here in Moose Jaw for your pets. They have doggy daycare, grooming and of course cat boarding! If you are coming into Moose Jaw to take in the sights and attractions but have your furry family member with you, give Paws N’ Play a call, they have great drop in options. Thank you ladies for looking after Simba. Simba our beloved office cat. Escape Rooms have become quite popular over the last couple of years. Matt Brewer of Little Chicago Entertainment had done several of them before realizing that Moose Jaw could use something of this nature. Wanting to add to the list of things to do in Moose Jaw, Matt and his wife Courtney started work on what has evolved from an escape room to so much more. Walking into Little Chicago Entertainment, you are transported back in time. The space has been made to feel like our famous underground tunnels. Brick walls, low lighting and comfortable seats adorn this area. Right now the space is in the process of being made into Moose Jaw’s first board game café. It will feature over 100 board games (which they are hoping to grow to 500 within the year), a licensed bar and food. They also plan to host several themed game nights for popular games like Dungeons and Dragons and Magic the Gathering. Look for this section of Little Chicago Entertainment to open a couple weeks into January. 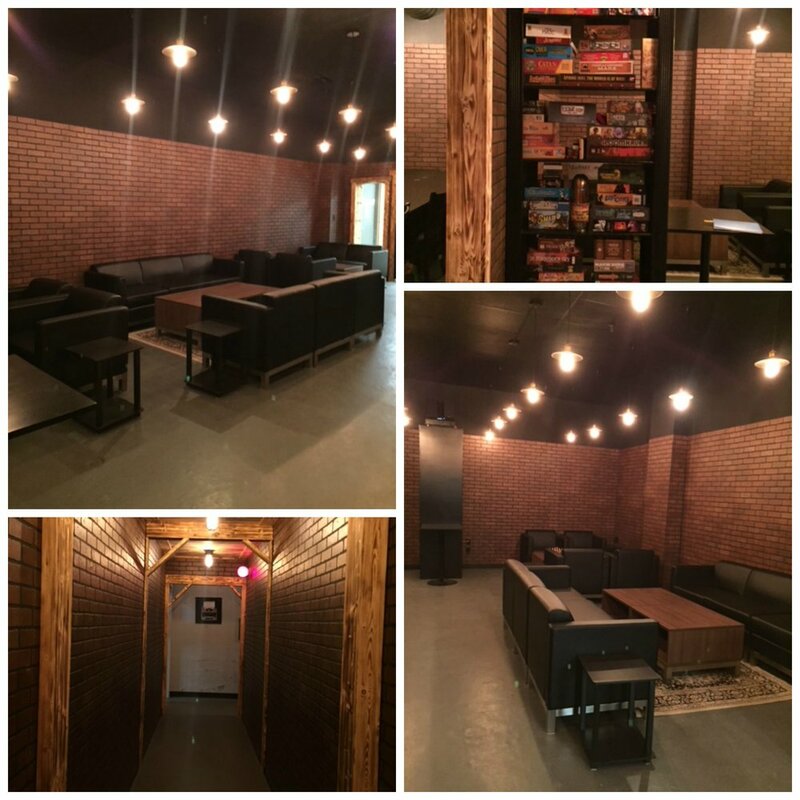 If you are looking for something fun to do with family and friends over the Holidays, checking out the 2 Escape Rooms should be on your list! Featuring “Mr. Capone’s Office” and “A Night at the River Street Hotel”, these rooms will take you back in time to experience some of Moose Jaw’s “colourful past”. Now I don’t want to spoil these rooms for you so I am keeping my lips sealed, but I will say from personal experience, they are fun, challenging and perfect for a night out. Another activity that Little Chicago Entertainment offers is ax throwing. If this doesn’t sound like something you’d enjoy I urge you to just give it a try. For a wrap up party this year we did the escape room followed by the ax throwing. I personally wasn’t as excited for the ax part of the night but ended up having such a fun time with it. It is much harder then it appears but once you get the ax to stick, you will be hooked! Over the Holidays, Little Chicago Entertainment will be closed December 24th, 25th and 26th as well as January 1st. Any other day, give them a call to set up your escape room time and who knows, maybe you will even take top spot on the leader board! Some Ax Throwers and Escape Artists. About a month ago, A Little Prairie Charm Gift Boutique and Tea Room became a member here with us at Tourism Moose Jaw. When Jacki (Executive Director at Tourism) told me about this Tea Room she was so excited. She explained how welcoming and friendly Shirley (the owner) was, how beautiful the Boutique is and how she was thrilled to have them on as members. Naturally I wanted to check it out for myself so this week I went and met Shirley. I felt welcomed the minute I walked in. Shirley was excited to show me around her store and I was excited to see everything she had. For starters, passion for what she does just radiates from her in an infectious way. You can tell just how much she loves what she is doing. Secondly, I was amazed at everything this little shop has! We started the tour in the kitchen area which is filled with all sorts of China. Instantly I was reminded of my Grandma’s beautiful set that was always on display in my Moms China Cabinet. Now we never really used my Moms Fine China…but Shirley not only lets you use them, she rents them out! If you are looking for something classic and timeless or you are more into shabby chic, she has just the right set for you! While we were going over the different dish options, Shirley started to tell me about all the events they have been holding in the Tea Room. From birthday parties, Christmas parties, baby and wedding showers and even a psychic medium! Her Tea Room seats about 35 people. It can be rented just as the room and you are welcome to bring in your own food or caterer or you can go with their full tea service. I can see having my daughters Birthday Party here or my parents Anniversary Dinner, the options are really open and the space is quaint and charming. The Boutique area in the front of the shop is the cherry on top! All the beautiful items to buy are perfectly placed. There is a little bit of everything, from natural and homemade items, tea blends specifically mixed for the Tea Room, blankets, bird baths and my personal favourite, the hand crafted (by Shirley’s Husband) birdhouse/feeders. The birdhouse is a tea pot that points down to a tea cup that you would fill with seed. The roof is finished in stucco and it all is mounted and secured on a wooden base. I think it would add a unique touch to any backyard or patio! Another thing I picked up on while being at A Little Prairie Charm is how happy everyone is to be there. From the ladies getting ready for their second tea since the Tea Room opened to the young women that came in to do school work, everyone was smiling and enjoying themselves. I left with a really good feeling that what Shirley has created is a great addition to downtown Moose Jaw. I would like to finish by thanking Shirley, for the tour, for being so welcoming and for the lovely Lavender Earl Grey Tea. You truly have something special at A Little Prairie Charm! 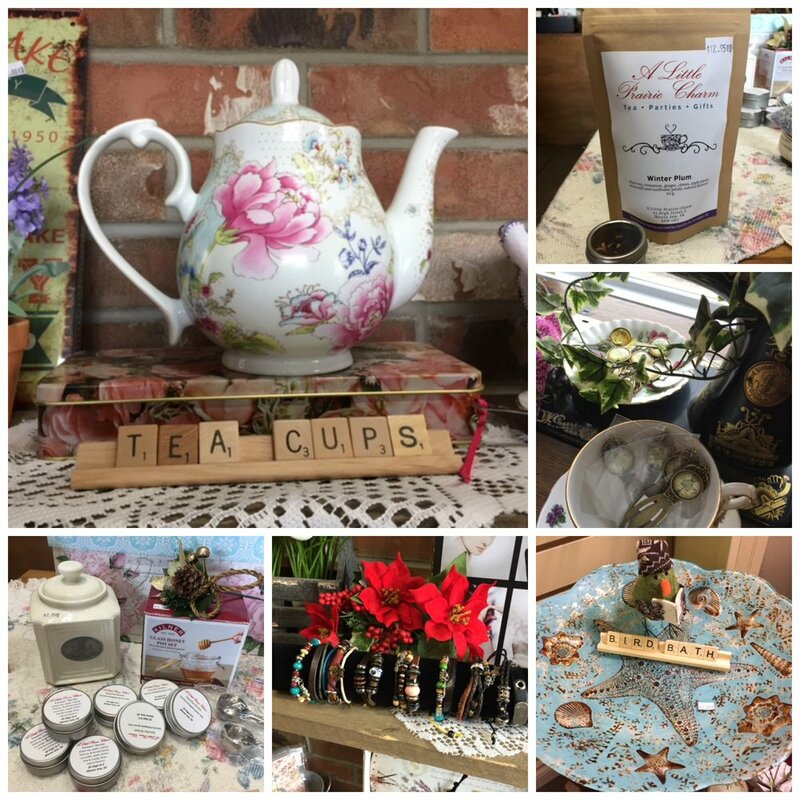 If you are still looking for that perfect Christmas gift or just want to spend an afternoon sipping some tea with the people you love, I highly recommend stopping in to see Shirley! A Little Prairie Charm is located at 35 High St. E.
They have a large variety of China, something perfect for any occasion. Enjoying my Lavender Earl Grey Tea. Thanks Shirley! A Touch of Elegance and Class, My Moose Jaw. Anyone who has walked through the doors at the Yvette Moore Gallery knows what I mean when I say elegance and class. For those of you that haven’t been, I would like to share with you what is behind the doors at 76 Fairford St. W.
The Gallery is located in the original Land Titles Office, running from 1910 to 1998. It was named a Heritage Property in 1997 and the Yvette Moore Gallery Project started in January of 1999. The building has undergone a number of renovations all while keeping the natural design and charm of the original property. One of the most surprising finds during this process was the solid copper window and door frames which to this day are part of the décor in the Gallery. Although new elements had to be added to the renovations, everything was carefully chosen to keep with the original beauty. While walking through the Yvette Moore Gallery, you can tell just how much care and attention goes into all the displays of various art mediums. Each standing out in its own right, from Yvette Moore’s beautiful works to those of other local artists such as Brysen Bert and Claude Morin, everything is perfectly shown. While your eyes are taking in all the beauty around you, your nose may pick up on something as well. Nestled in the back of the Gallery is something so special in itself, The Gallery Café. The aromas that fill the Gallery will have you hungry almost instantly! So naturally lunch was part of my visit. The Gallery Café was on my list of places I needed to visit. This was the first time I have dined here and I can tell you, I left happy! I started my meal with the Hot Apple Cider which was a great choice for a chilly day. Next I had the Vegetarian Spinach Pie which I am told is a classic favourite, and a cup of their homemade Cream of Mushroom Potato Dill Chowder. Everything was perfect and I can see why this is a popular choice among locals for lunch. We finished our meals off with dessert which consisted of Gingerbread with a Lemon Butter Sauce and Grandma’s Bread & Butter Pudding! All I can say is dessert is a must when you visit The Gallery Café! One of my absolute favourite things about The Yvette Moore Gallery is how local everything is. From the artists to the ingredients used in the kitchen, they all share that common theme. There is something so special to know that what you are purchasing supports hard working people in your community! In closing I would like to thank Yvette and Sarah Moore for having us in to snoop around and for the amazing lunch you treated us too, it was much appreciated! I was impressed from start to finish. Yvette Moore’s painting of the original Temple Gardens Dance Hall. This iconic Moose Jaw building is what Tourism Moose Jaw is modeled after. If you are from Moose Jaw, chances are you have visited the Western Development Museum. It is one of 4 museums in Saskatchewan that focus on our Heritage. The other museums can be found in Saskatoon, Yorkton and North Battleford. Moose Jaw lets transportation take the spotlight. 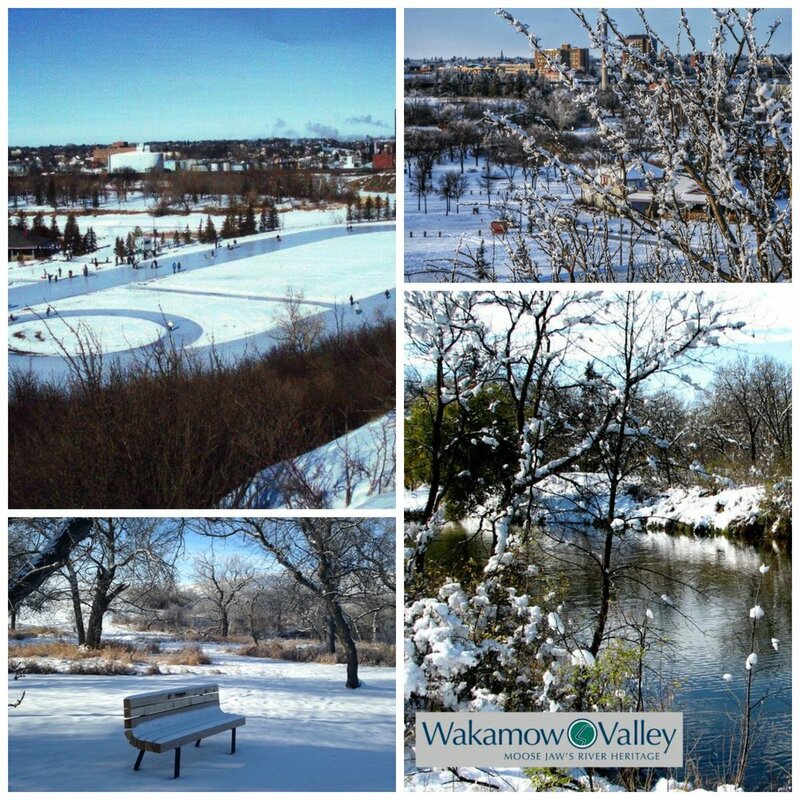 With over 100,000 square feet to explore, it is easy to see why people love to visit the WDM. Well loved artifacts aside, the WDM offers a lot more than just the exhibits. They run at least one event a month. The events will vary from “In Remembrance” to honour our Veterans, “Ghostly Games” for your little ones or a favourite around the WDM, “A Christmas Long Ago”. I spent some time with Karla Rasmussen, the Education and Public Program Coordinator for the Moose Jaw WDM. I was lucky enough to get to go behind the scenes and see the set up for the upcoming Christmas event. Children will get to step back in time to see what Christmas was like 100 years ago at Grandma’s house, complete with a gift opening that shows the kids what children like them would have received so many years ago. They will also get to make some fun Christmas crafts. “A Christmas Long Ago” will be held December 15th and 22nd and there is still room to get your child registered! There is a cost to non-members for events such as this one. However, a family membership is very reasonable at $70/year. 3 visits to the museum and you’ve recovered your cost. One perk of the membership is that nearly every event the museum puts on is no charge to attend (with the odd exception) and you also get access to pre-event nights exclusively for members. Another area of the WDM worth checking out is their Gift Shop. I personally love all the little unique items that they carry and have purchased several of my children’s teacher gifts from here. They have toys and knickknacks, clothes, beautiful glass charms to catch the light from a window, purses and a whole section dedicated to Saskatchewan made items. It is so worth a stop just for this! The WDM also has two separate rooms for rent. They can be used for meetings, Christmas parties, banquets, tour groups and so much more. They allow catering and if you are lucky enough, you might even be able to book a special event in the museum. Imagine eating your dinner in the Aviation Area! One thing the WDM is always looking for is Volunteers. They are hosting a Volunteer Blitz on January 19th and anyone interested in volunteering can attend this information night. Several different areas are always in need of extra hands to help. If you have a love of steam engines, consider becoming a conductor for the Short Line 101! A special thank you to Karla for showing me around! I feel so lucky to have this museum in Moose Jaw, with so much to offer. I hope you check it out. “A Christmas Long Ago” takes place in Grandma’s House! “Shop at a store with a door” is a phrase I am sure you have probably heard around Moose Jaw lately. The whole idea is to get people to shop less online and focus more on the great stores you have in your own city. It supports community growth and opens up opportunities for more small business. For me, shopping isn’t one of those activities that hit the top of my list. What can make this better for me are friendly staff, well organized stores and one of a kind treasures that are most often found in smaller more local shops. When I started this Blog one of the goals I had for myself was to get out and see what Moose Jaw has to offer. Experience the city like I encourage visitors to do. This week I decided to go check out a business I hadn’t been to before. That led me to Real Deals on Home Décor Moose Jaw. Walking in to the store I was immediately blown away, the displays set up all around are so well done. Filled with groupings of home décor and Christmas decorations, they showcase how you would put these items together in your own home. Whether your taste is country, contemporary or more classic you will find something here that will go perfectly with your style. Aside from Home Décor they have a ladies clothing section. Mannequins adorned with carefully selected outfits are placed all around, giving you ideas of pairings you might not put together on your own. I should also mention their sizing is from small to 3x, giving lots of variety. You can also find novelty socks with sayings like “Mama Bear” on the sole, sunglasses, jewellery, candles and any Christmas decoration you could ever want to buy, all arranged in colour and style for easy matching. Located at 30 McKenzie Lane, Real Deals is a little off the beaten path but so worth a visit. I can guarantee you will be pleased with the well laid out show room and friendly staff. I would like to wish owners Jerri-Lynn and Sean congratulations on their 2nd Birthday! Also a special thank you to Jerri-Lynn for showing me around. How About Some Loud Music? Have you ever caught yourself saying “there is nothing to do in Moose Jaw”? Well I would like the opportunity to change your mind! Every week I spend a couple hours searching out events in Moose Jaw and adding them to our event section at www.tourismmoosejaw.com. There is always a good mix of things to get out and enjoy, like family activities, craft and trade shows and live entertainment. One of the things I feel we are very lucky to have in Moose Jaw is our local music scene. We have a lot of talent living in our city. Just about every week in Moose Jaw you can find some kind of live show. Whether you are grabbing a beer at Cask 82 on the weekends or taking in a bubble tea and a Festival of Words performance at Mitsu Sweet Café, there is something for everyone. This weekend I invite you out to The Park Hotel. Local band, The 86’s are having their album release party for “The Many Rooms of Old Lady Winchester”. The band is made up of 4 guys, Dave Howard, Anthine Savoie, Ryan Stusek and Jamie Robb. You will hear some old favourites like War Pigs by Black Sabbath and Immigrant Song by Led Zeppelin but you will also get a taste of their original music, a mix of heavy groove rock and roll with a punk twist. I promise they will not disappoint. Taking the stage with The 86’s are Regina bands, Above the Crown and Sing the Body Electric. Three bands for the price of FREE! The show is this Saturday at 9:30 pm. I encourage you to get out and see what Moose Jaw has to offer and I hope to see you at the show Saturday Night! Located on the once infamous River Street is a quaint little restaurant with great atmosphere and food to match. Rosie’s on River Street serves up elevated pub food utilizing local ingredients when possible. On their menu, you will find Gravelbourg Mustard and Coteau Hills Creamery Cheese. Behind the bar you will find Last Mountain Distillery, Churchill Brewing and Moose Jaw’s own Prairie Bee Meadery. Their menu ranges from Shopsy Hot Dogs to a Cuban Sandwich, a great list of appetizers and arguably the best French Onion soup in Moose Jaw. Their burgers are what they are most known for. Taking home the “Best Burger” in Moose Jaw award for 2018 speaks for itself! Topped with an assortment of fresh and comforting ingredients, they will satisfy any burger craving you have. Great food and local ingredients aside, the décor is funky, eclectic and unique all at once. With ceiling tiles painted for local sports teams and businesses, numerous collections displayed and their mascot moose hanging behind the bar (if you want a good story, ask the owner about the moose) it is truly one of a kind. When the weather is warm, nothing beats a cold drink on their patio. Perhaps my favourite thing about Rosie’s is how it got its name. Rosie Dale was one badass woman back in the day. She ran a brothel, and when confronted by the crooked police chief for his cut of her profits she packed up shop and took it out of Moose Jaw’s city limits. Seems like an easy way to lose some of your business, right? Well Rosie had that part figured out. She would send her unmanned horses into town to pick up “Johns”. The horses would then take them out to her business and when they were done, they would be returned to town on those very same horses. Now that’s an entrepreneurial spirit! This story has been my favourite one to tell since I started here at Tourism Moose Jaw and Rosie’s on River Street is always a favourite around our office with the summer students and tourists. Next chance you get, give Rosie’s a try, I promise it will not disappoint! I would like to share with you two local groups in Moose Jaw that highlight some of the amazing talents we have tucked away in our city. The Moose Jaw Art Guild and The Moose Jaw Camera Club. The Moose Jaw Art Guild is a membership based organization that brings artists together to share their love of art and creativity. They use several different mediums, all unique to the artist. Memberships are very reasonable, $25/year for adults, $15/year for youths (14+). With your membership you get the opportunity to participate in exhibitions, attend skill building workshops, be involved in peer to peer groups and be a part of art excursions to other communities! We have a wall in our gift shop at Tourism Moose Jaw where we display several of the Art Guilds pieces. Many travellers over the last year have left with a little piece of Moose Jaw to take back home with them. If you would like the chance to get a better look at what these artists can do, they will be on exhibit at the Moose Jaw Museum and Art Gallery from November 8th to January 6th. The opening reception will be held November 8th from 7:30 to 9 pm. The Moose Jaw Camera Club’s photos cover our walls at Tourism Moose Jaw. When you walk around the centre you will see our buddy Mac in several different poses and backgrounds, some of the most beautiful Saskatchewan scenery and iconic images of Moose Jaw, like the 4th Avenue Bridge. Their annual membership is also reasonable at $40/year. This gets you access to club activities, outings and meetings. Their Facebook page, www.facebook.com/groups/moosejawcameraclub is a good starting point. The club is full of knowledgeable photographers that have mastered their art. I encourage you to come visit us at Tourism Moose Jaw and see what these local photographers and artists can do and with Christmas only a couple months away, you might find the perfect gift for the art lover in your life! Look for Local Talent Part 2 in the coming weeks! My Wednesday nights for the past several months have been dedicated to one thing, Chase the Ace. For anyone who doesn’t know what that is, you purchase a $10 ticket from the Moose Jaw Kinsmen Club; it gets added into a draw. If your card is drawn you automatically win the “pot” for that night and get a chance to “Chase the Ace”. If you choose to try your luck at picking a card, you could be the lucky winner of their Jackpot, which is now over $29,000. My partner in crime for this event and I always split our tickets 50/50. We won once back in May when the take home was only $210. A far cry from the $1800 that went last night! Winning is great, but even if your number isn’t drawn the money goes to a good cause. This group of guys does a lot in our community and I have enjoyed myself supporting their fundraiser. If you would like to learn more about the Moose Jaw Kinsmen Club, please check them out at www.facebook.com/mjkinsmen. Now I need to give a shout out to Cask 82. This is where the event is held every Wednesday. In the several months I have been going I have had some of the best service in Moose Jaw. The ladies working are always friendly and even when they have a packed and crowded bar, I’ve never had to wait very long for a drink or anything else I might need. A specially selected menu different from the bar and grill above is available. I highly recommend the Vegas Fries and the Mediterranean Flat Bread. They also serve craft beer and cocktails and have a great wine list. Now they are only open Wednesday to Saturday, so keep that in mind if you are planning to go. There is also a 24+ age limit. Friday and Saturdays are perfect to check out Cask 82 as live music takes the stage at 9 pm. We are down to the last 2 weeks of Chase the Ace, for this pot anyways. Some lucky person will walk away with a nice chunk of cash and the rest of us will relish in the suspense of months of hoping to hear our numbers read out. Look for Chase the Ace to start its second round on Wednesday, November 14th with a beginning Jackpot of $5000. Good luck to all my fellow ticket buyers in the coming weeks! Good morning! This is one of my favourite times of the year around Tourism Moose Jaw. The traffic has slowed a little, but that doesn’t mean there is a shortage of stuff to do! Along with Halloween activities, we are also getting ready for Christmas in October, coming soon! One of the highlights this weekend the Moostletoe Artist Studio Tour (great name by the way). With so many great events going on it’s hard to choose which ones to go to! I’d like to help so here is my list of MACtivities for this weekend. Enjoy, Mac.